Great Danes are not supposed to have sloping toplines. Their backs behind the withers are supposed to be parallel with the ground both standing and moving. Neither ski-sloping backwards nor overbuilt (bum-high) – unless they are puppies of course. When they run, they are not supposed to run bum – high as if they’re going down a hill. They are not Bobtails and they are not Fila Brazileiros. When trotting, they are not supposed to “fall on the forehand” either, to borrow a phrase from German Shepherd Dog terminology (which the GSD community borrowed from horse terminology originally – see a horse heavy “on the forehand”). First of all, Great Danes are long-limbed fast galloping dogs and not drovers. 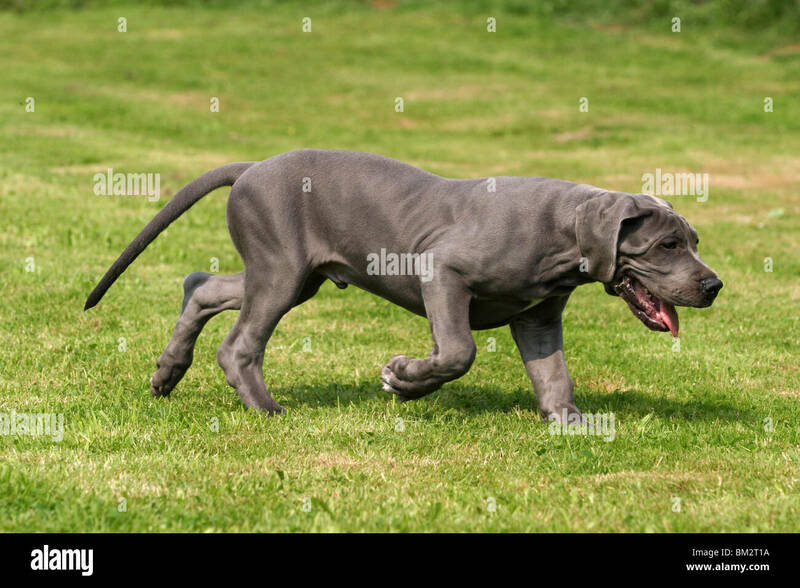 Secondly, as an endurance – galloping dog, they are supposed to be square, with more angulation in the rear than in the front, a long foreleg and equal length of scapula and upper arm. (This configuration actually means less extension than a trotting dog – but that’s another subject for another post). The Great Dane is supposed to be built like a giant English Pointer, basically. Or a gigantic Foxhound, generally speaking. That necessitates high withers. And please note that high withers does not mean a sloping topline: the back remains level. Short necks go together with short vertebrae, insufficient distances between spines and / or between vertebrae (thin intervertebral disks). That doesn’t only cause problems with front assembly, compromising the efficiency of locomotion, but potentially predisposes the dog to spinal injuries and spondylic issues in the area of the neck and shoulder. Especially if it has to carry an overly heavy head, as many hypertype dogs do. Short necks result in insufficient layback of shoulder which brings the tips of straight shoulders often above the tips of the spinal processes. That causes the tips of the shoulder blades to lose a considerable amount of their ability to pivot (as they are closer together and more firmly tied with muscle), reducing the stride. It’s a slower configuration that is typical of mastiff breeds. It’s the short neck that causes straight shoulders and not the other way around! And despite the tips of the blades being ‘high’ (because they lack lay-back) the withers are actually ‘low’ (because the dorsal spines are below the tips of the scapulae) and therefore not efficient in holding the Great Dane’s front assembly up on the move. The FCI standard of the Great Dane calls for high withers because a giant breed built for fast running, while carrying a large ribcage with deep chest and long forequarters, absolutely needs this high “bridge” and lever system of the withers to carry itself well. And carry the long neck too – because the ligaments and muscles that extend and flex the neck anchor over the withers. On a short-necked mastiff or bulldog low withers is not so much of a problem but on a longer necked Dane it is. Another way we get low withers is from short scapulas. Short scapulas are not long enough to reach the very tips of the spinal processes: that allows for greater laxity of the shoulder blade. While this actually enables more extension of the stride, because the shoulders can pivot more, for a breed the size (height and weight) of the Dane it’s inefficient. [Length of forequarter stride in the trot is greater in the trotting breeds and lesser in the galloping breeds because galloping breeds have less angulation in front but their flexibility of spine, more tuck up and rear angulation plus more length of foreleg offers them greater extension during the gallop]. This configuration (of spines considerably higher than blade tips) would be fine on lightweight pure sighthounds (and indeed pure sighthounds have relatively shorter scapulas – or, to be more accurate, relatively shorter than their humerus) but combined with the weight of the Dane’s ribcage it causes failure of the front assembly: we can actually see the gaps directly behind the shoulder blades as the ribcage is hanging lower than it should be; such a dog with loose shoulders is not able to carry itself properly and we notice the shoulders bounce vertically on the trot; with advancing age and softening of muscle the dog will break down more and quicker in the front, especially if it has the overdone heavy forechest which is all the rage nowadays, or even worse, too broad and round a ribcage, instead of the correct oval. As the Dane carries the heritage of both mastiff and pure sighthound it can ‘throw’ any of these front assembly configurations and/or combinations of the above. So it’s truly a fine art to get the Great Dane just right, being such a composite breed and with the additional requirement of squareness which leaves zero room for error. Obviously the best design for the Dane’s front is what (confusingly) some call “level” withers (shoulder tips level with the spinal processes) or “high withers” (more appropriately) because these withers are higher than the rest of the back (thoracic + lumbar). And critically the withers must be higher than the hips or than the curve that occurs in the lumbar area (the rise over the loins). In Great Dane terminology high withers are withers that a) are higher than the short, level back and b) the tips of the shoulder blades are level with the tips of the spinal processes of the thoracic vertebrae. During the trot, the withers of the trotting dog remain visibly higher than the line of the back and the withers of the galloping dog just slightly above the back line or even level with the rise over the loin but n e v e r lower. So it’s quite clear from all the above why your dog is running downhill while on level ground: if the Dane has low withers its front assembly will collapse during the trot and the dog’s shoulder will visibly fall lower than the hips, with the result of the foreleg having to lift higher to clear the ground. The topline is dipping forward and the dog is scrambling to stay up like a horse heavy on the forehand. Needless to say this is a very wasteful error in locomotion – it’s biomechanically inefficient. It slows the dog down considerably, it doesn’t cover ground, it requires much more effort, tiring the dog quickly and therefore it’s undesirable as a grave fault for the breed. a) if they are caused by dorsal spines considerably below the blade tips and “tied shoulders”, they don’t allow the shoulder tips to pivot well back (the same effect can be caused by a different fault -loaded shoulders); so the point of shoulder (the joint of scapula and humerus) remains low, and the upper arm cannot travel forward fast enough and long enough to lift the foreleg in good timing with the back step (especially if the upper arm has the extreme return that is not typical of galloping breeds, but so many folks fancy nowadays because “it looks good” in the show ring – and since Danes don’t work anymore, not many people have actually tried them the in the field to see how much slower they are and how much less endurance they have with these exaggerated, heavy fronts! This is one of the myriad side-effects of generic judging that expects and rewards dogs that look similarly exaggerated and “aesthetically appealing” as if they were static ornaments and without much consideration to the different purposes that shaped their form or to the biomechanic requirements of efficiency & soundness; judges who have not been taught the difference between a breed developed for trotting and a breed developed for galloping, for example, will expect all dogs to move around the ring like American Cocker Spaniels or Rottweilers); so when the hindquarter comes forward the foreleg is lagging and the dog has to flick its pad upwards instead of just skimming the ground in perfect timing of front and rear assembly without wasted motion. b) the low withers also lack the power to carry the neck to the optimal position; that additionally causes delay and incomplete forward stride. The dog flexes at the elbow more than a dog gliding forward with the topline parallel and just skimming the ground with its pads, because if the low-withered dog that’s falling on the forehand doesn’t flex at the elbow (and at the wrist, correspondingly, wasting effort and precious energy) it will crash into the ground, it will nose – dive and its paws will drag on the floor or come to a halt. See this heavy puppy here falling on its forequarter. And see this other puppy here striding well. Our breed is essentially a modified gazehound – hence the relatively high neck / head carriage for spotting prey in the distance when standing – but also carries the influence of mastiffs and mountain flock guardians that are very different in ‘geometry’ and typically carry their necks lower – so we are likely to get a variety of over-built structures, short necks, low withers, long backs, sighthound fronts etc; it’s a constant struggle to keep the Daneness in the Dane and the greatness in the Great, while at the same time avoiding to shoot the COIs sky-high. But that’s precisely the challenge and the allure of breeding fine dogs, and the finest thoroughbred of dogdom, the Apollo of dogs especially. So that’s what causes your Dane to run downhill although it’s on level ground. In a nutshell, low withers – low neck and over-built (higher at the rear than in the front) will cause the dog to fall on the forehand. Over-built (bum-high) torsos tend to go together with longer bodies and shorter legs that look appealing on the confines of the show ring trot because they are neat: their legs don’t cross under the body so they don’t have to compensate to avoid interference and they may even have longer strides – but they are of course unfit for the specific function our breed was developed for. We are not supposed to be breeding long-bodied trotting specialists but square, fast, galloping Great Danes ! Naturally on the fast trot the neck is not carried high – but it’s still carried sufficiently above the line of the back – about 30 degrees to the horizontal. Breed for high withers, long necks (but not excessively so: just equal to the – typically long – Great Dane head) and sufficiently long scapulas that are equal in length to the upper arm. Breed for balance and moderation. Breed for withers above the line of the back and moderate angles in the front (105 – 113 degrees), long forelegs and neither excessive forechests nor excessive returns of upper arms. Because those are not Fit For Purpose for a fast, endurance galloping Hound. [Watch a simple not very technical video that explains the different dog gaits – except the gallop – here]. If you do a google search “German Shepherd Dog falling on the forehand” you will find a plethora of articles using the term on the net. Veterinarian. I second that like! I’ve shown German Shorthair Pointers, and have owned “Show Quality” Great Danes. You need to know all breed Standards and terminology which consists of a Vast amount of knowledge.. I’m just extremely Surprised you never heard of this terminology?